We made the cutest little decoration this week. It was kinda tricky deciding what I would call them - Popsicle Stick Christmas Tree Frame Decoration is just way too much of a mouthful lol!! So let's forget the name and get onto it shall we. 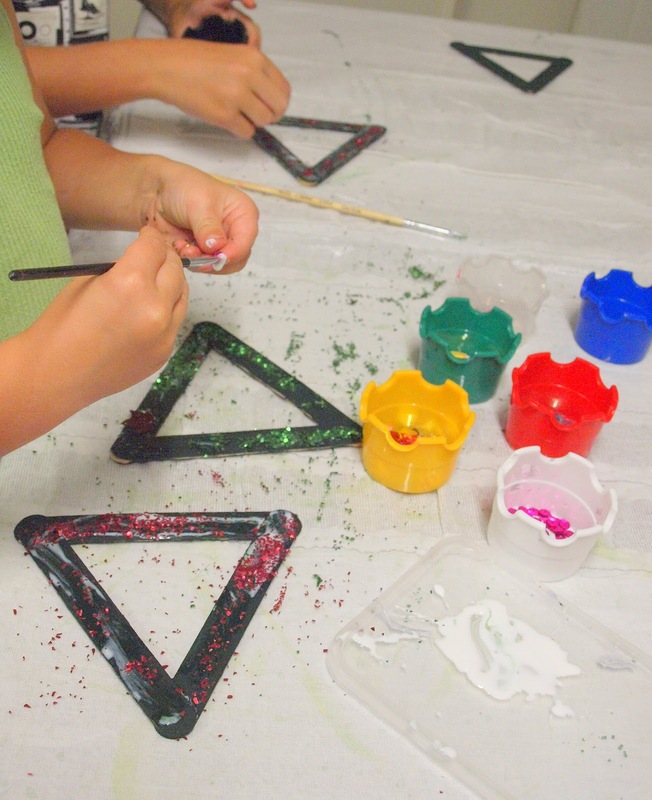 I chose to use the wider craft sticks as I felt they would be sturdier, with a larger area for gluing and decorating. 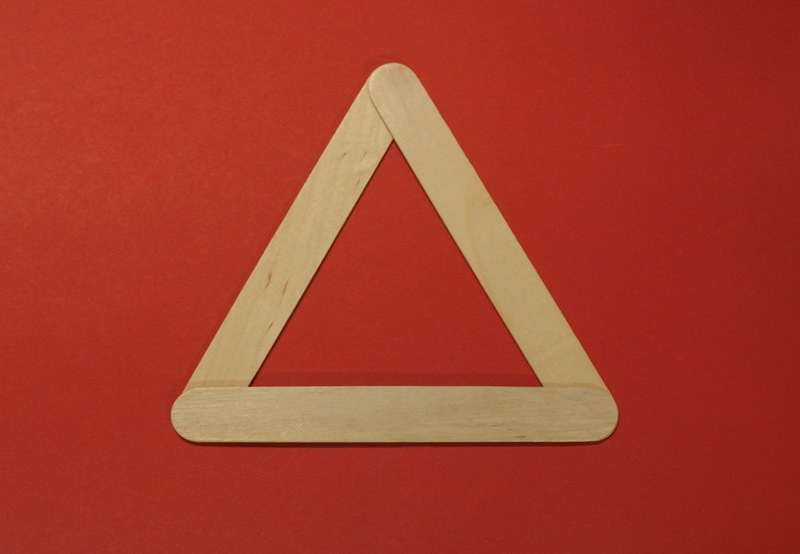 Glue three together to form a triangle (the tree). I did these ahead of time so that the glue had almost dried by the time we were ready to decorate them. Paint with gorgeous tree green on both sides and allow to dry. Or if, like us, it is a pouring day and there is no chance they'll dry anytime soon, grab your hairdyrer and blast them dry. 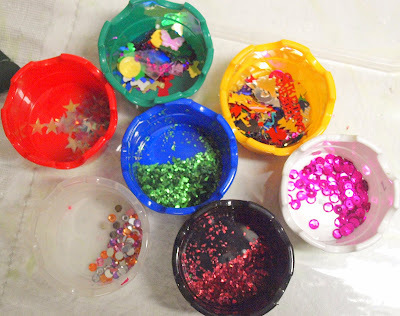 I gathered a few sparkly decorations and some white craft glue and let the kids at it. They glued, glittered and decorated their triangle trees. Whilst the glue sat drying we went to find some suitable photographs that would fit into the triangular shape. I needed to print them out wallet size if that is of any help. It still leaves some white in the background but depending on your image you may not have that to worry about. 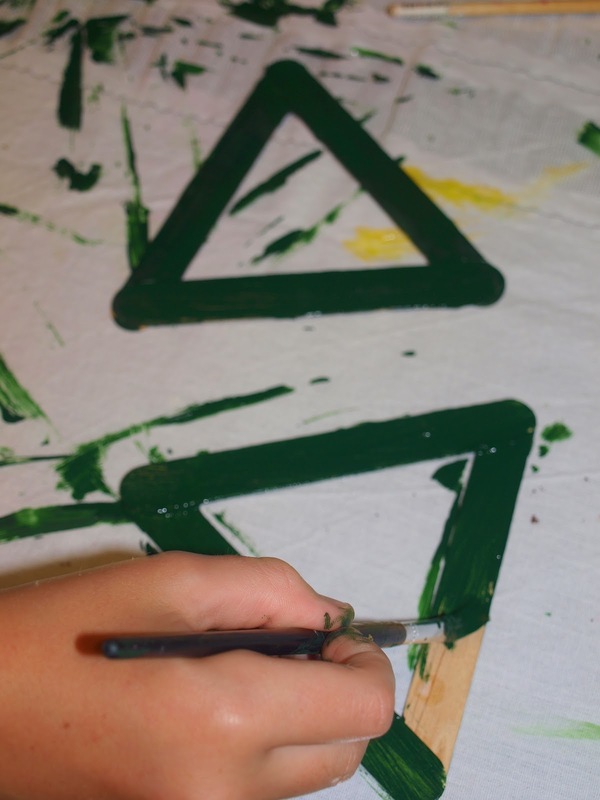 I used the triangle tree to trace the shape around the photograph and then cut well within that line as I didn't want any overhanging pieces of white card. Once the glue is all dry and the decorations are staying put, I flipped them over and glued the photograph to the back. 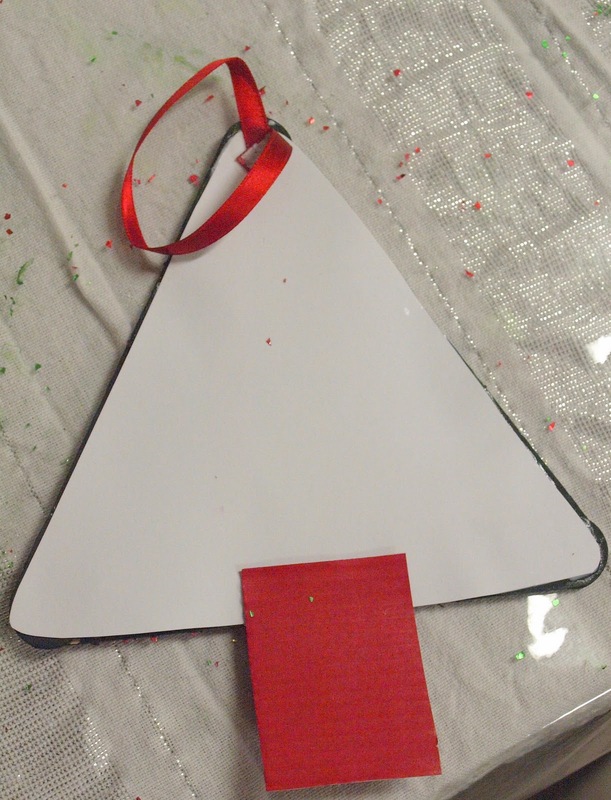 I dug around in our card scraps for a piece suitable for the tree trunk and glued that on also. Found a piece of ribbon and glued it in a loop at the top so we can hang it easily on the tree. The next step is not necessary but we decorated a second tree and glued it to the back. We needed pegs to hold them altogether and left them overnight to dry. 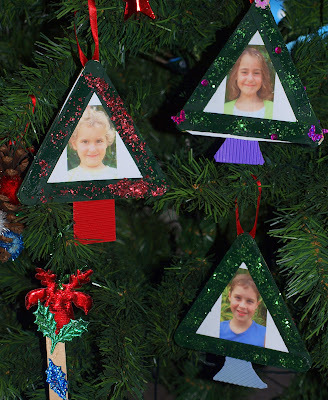 The next morning we hung them on the tree. We love them! I did think that we could have added a magnet to the back instead of the ribbon and they would be cute grandparents gifts. 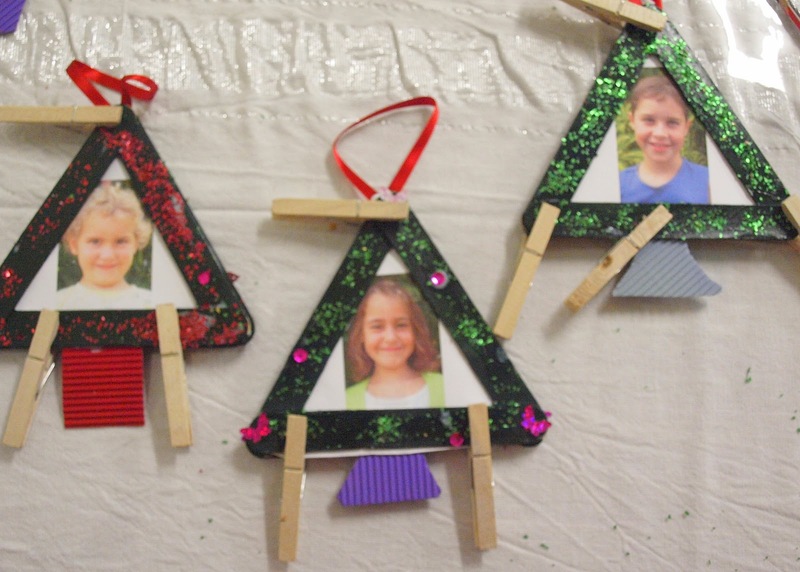 Have you added your Christmas crafts to the Christmas Fun Link Up yet? What a great craft. 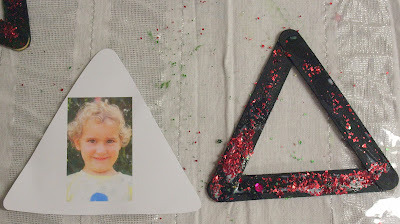 I would love it if you would share it at my sharing party at http://craftymomsshare.blogspot.com/2011/12/sharing-saturday-8_09.html. Thank you! What an awesome craft! Thanks for sharing! these are so cute! we made the trees but love the addition of the photo! Thank you for sharing at Sharing Saturday!